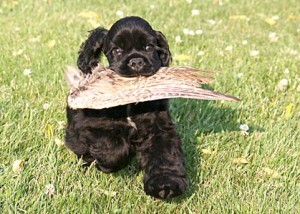 Do Cocker Spaniels Really Hunt? It’s a question that comes up frequently at judging seminars. And the answer is – absolutely! More importantly, it’s something all judges should keep in mind when considering the Cocker Spaniel in the conformation ring. The Cocker Spaniel is the smallest of the sporting dogs. It and the other flushing spaniels were developed in the 19th century from a group of dogs known as field spaniels. 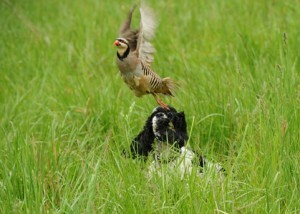 The smaller dogs in litters became known as cockers because they hunted a bird known as a woodcock. Without a small dog to go under hedge rows, and through brambles and other bushes, hunters would not have been able to flush those birds out into the open. Even though the Cocker Spaniel is a small dog, it is not without substance. The standard calls for a Cocker Spaniel to have a “sturdy, compact body,” ribs that are “deep and well sprung,” and forelegs that are “strongly boned and muscular.” That includes a front structure that allows it to push its way through thick brush, gives it balance when carrying birds as large as a pheasant or duck, and provides for a depth and length of rib to give it heart and lung capacity for endurance in the field. 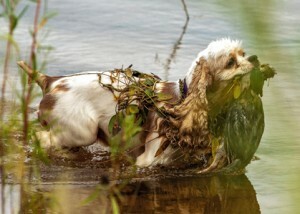 Field work for the Cocker Spaniel also includes retrieving from fields, marshlands and open water. To do that job, a Cocker Spaniel must have adequate length, width and depth of muzzle and large strong teeth to allow it to hold and carry a bird, and large nostrils to allow it to breathe. 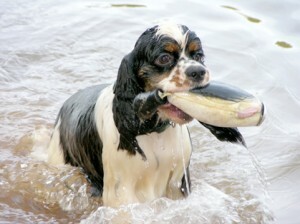 The standard calls for the muzzle to be “broad and deep, with square even jaws.” The size of the head must be in balance with the rest of the dog, but a head that is small, with a short muzzle and tiny teeth is a detriment to the ability of the Cocker Spaniel to work in the field. Invariably when discussing the breed and its ability in the field, someone will say “they certainly can’t hunt with all that hair!” The standard called for “excessive coat or curly or cottony textured coat to be severely penalized.” “Excessive coat” refers to volume, rather than length. A long coat can be cut to a shorter length if the dog is to be used in the field. But a dog with too much volume of coat, even when short, is at a disadvantage in the field because of the amount of water and debris that these dogs work through. Cockers which have undergone seasonal shedding or those with a moderate amount of coat should not be penalized. When Cockers hunt they need to cover a lot of ground when scenting and retrieving birds, which requires efficiency of movement. A Cocker needs to cover the most amount of ground while expending the least amount of energy. Gardner says, “when judging the cocker, the most showy dog may not be the most efficient moving dog. The cocker that throws his head back and has a high head carriage is less efficient and will tire much more easily in the field.” Short, choppy action in the gait is not efficient movement. Finally, do Cocker Spaniels still have the instinct to do field work? 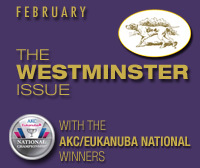 The American Spaniel Club’s Judges Education coordinator Nancy Gallant says, “if we put a wing in early and start retrieving at a young age, I think we would find they are apt for it.” Her dog Keeper has attained his Senior Hunter title along with conformation and performance titles. The American Spaniel Club offers The Ruby Perpetual Memorial Award, in honor of of CH. Pett’s Southwest Breeze SH MH CD WDX, the first Cocker Spaniel ever to attain this group of titles. The most recent recipient is Jeanne Grim’s “Millie” – CH MACH7 Skiboo’s One Censational Night CDX RE MH WDX MXC2 MJS3, who attained her Master Hunter title at 11½ years old. Hunt tests and field instinct testing will be held at the American Spaniel Club’s 2014 National Specialty at Purina Farms in Gray Summit, MO. 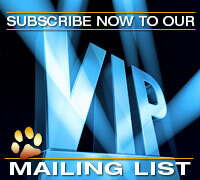 The field committee encourages all those interested in learning more about the hunting ability of Cocker Spaniels to attend. Our Friend the Cocker Spaniel, edited by Rowland Johns, copyright 1932, E.P. Dutton & Co.
Posted by chesliepickett on Feb 18 2014. Filed under Featured, The Buzz. You can follow any responses to this entry through the RSS 2.0. Both comments and pings are currently closed.